My favorite type of recipe is the perfect quick and easy dinner – something that takes only a few steps and a few ingredients and will be ready in 30 minutes or less. You can find all kinds of recipes on the Net, but in most cases they won’t have the macronutritional profile I want or will simply have way too many calories. And that’s why I love to create posts like this! These 7 quick dinner ideas are perfect for when you’re low on time but still want to eat something tasty. If you find one you really like and want to eat regularly, use an app like Out of Milk or Grocery IQ to keep the grocery lists on hand. This sounds gourmet and you’ll feel like you’re eating at a fancy restaurant, but you can easily make it in your own kitchen with simple ingredients. It can take a bit to chop everything you need for this dinner, which is why I love my VeggiChop. If you don’t have one and definitely need the cook time to be a half hour or less, prep your herbs, onion, etc., ahead of time. Get all your ingredients in a row on Sunday, and you’ll have an easy and delicious weeknight dish for Monday or Tuesday. Mix together all herbs with lemon peel. Season chicken with salt and pepper to taste. 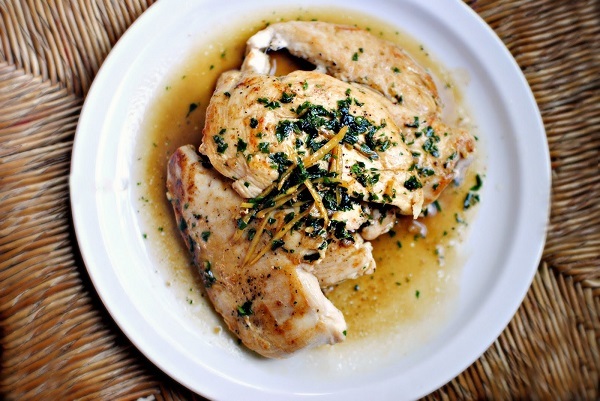 Heat butter in a large skillet over medium-high heat, and cook chicken breasts until they begin to brown, about 6 – 8 minutes. Remove chicken from pan, and set aside. With the skillet off the stove, add the stock, and scrape the bottom. Stir in 3/4 of the lemon-herb mixture, and return to heat. Stirring often, bring the liquid to a simmer. Add chicken back to pan, and turn to coat. When finished cooking, approximately 6 – 8 minutes, remove from heat. As the chicken simmers, heat olive oil in a separate pan. Add prosciutto and onions, and stir occasionally. Once the prosciutto crisps, likely right after the chicken breast is finished cooking, stir in the peas and a spoonful of water. Cook, tossing, for several minutes until hot. Lightly season with salt and pepper. Dish up the peas and the chicken breast on four individual plates, and serve. If you you’ve already eaten most of your carbs for the day come dinner, you’ll love this updated version of the Chinese classic. These eggy pancakes are usually smothered in gravy, but you can use low-fat sour cream, fresh salsa, or guacamole instead. Whisk together eggs, chives, and salt until smooth. 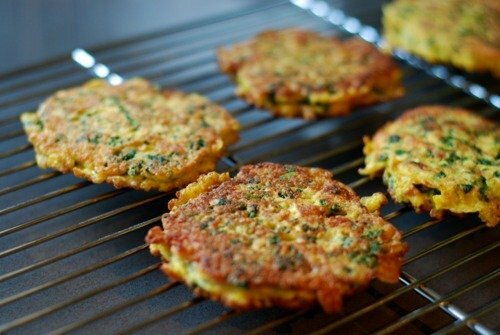 Mix in coconut flour and baking soda, followed by spinach, ham, and apple cider vinegar. Heat coconut oil in a skillet over medium heat. Scoop a scant 1/4 cup of batter at a time into the pa, and flatten with the back of a spoon. Fry for two minutes, flip, and finish cooking for another minute. Cool slightly, and serve. This recipe is from Whole Grains for Busy People by Lorna Sass, a knockout cookbook that everyone should keep on hand. 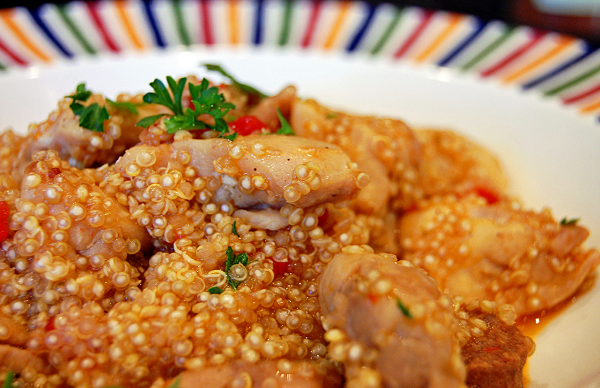 It also has quick dishes with farro, barley, and bulgar. Season chicken lightly with salt and freshly ground pepper. Heat olive oil in a heavy 3-quart Dutch oven, and brown chicken pieces for about two minutes on each side. Remove meat, and set aside. Turn off heat, and after the oil in the pan cools for a couple minutes, stir in spices. Add chicken broth to the Dutch oven, and scrape the bottom. Stir in tomato paste, and bring to a boil. Stir in quinoa and chorizo, cover, and simmer for 12 minutes over medium heat. Add salt to taste, and place chicken back in the pan. Cover again, and continue cooking until the quinoa and chicken are done, about 2 – 3 minutes. If it looks like it needs more time, pour in a little more broth, stir, and cook for several more minutes. Stir in veggies, and cover for one minute. Add chopped parsley, and serve. If you make a large pot of miso soup ahead of time, you’ll be able to enjoy this comforting soup at the drop of a hat. The dashi can be refrigerated for four days and the soup for two, but it can be kept frozen for several months and warmed on the stove before adding the finishing touches. Before making dashi, have a medium-sized bowl or 2-quart container at the ready with a fine mesh strainer or cheesecloth. Combine 2 quarts of water with the kombu. Heat until just boiling, turn off stove, and remove kombu. Now add the bonito flakes, stir, and let steep for 5 minutes. Strain. Add miso paste to a small bowl, and boil the dashi before pouring one cup of it over the paste. Pour the bowl contents into the pot, and whisk over low heat until all miso is combined with the broth. Stir in tofu and scallions. 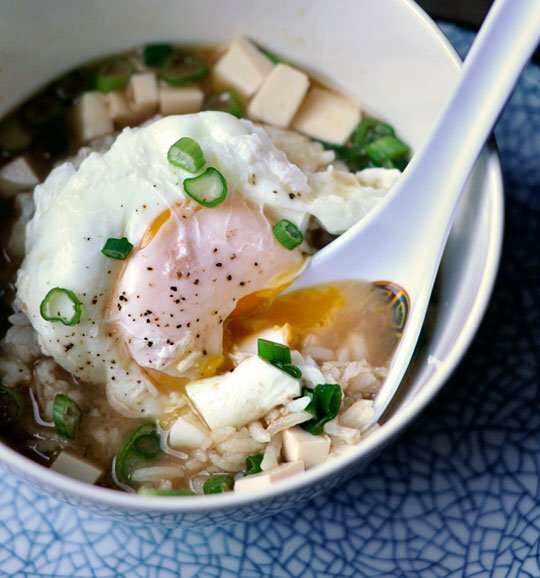 Turn the miso soup into a hearty dinner by ladling the simmering broth into a bowl. Carefully crack one large egg into the soup, cover the bowl, and allow it to poach for several minutes. Add brown rice and any desired condiments. There’s nothing as satisfyingly simple as sticking big hunks of meat on a stick and grilling it. 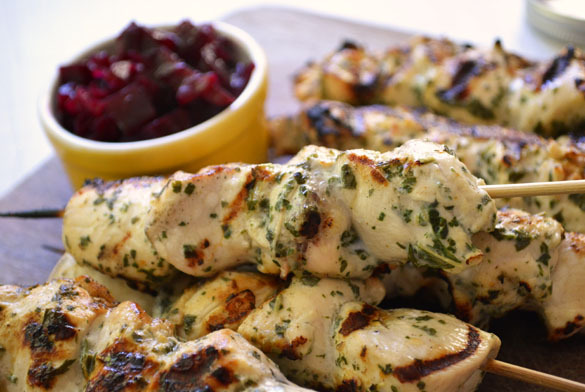 But these skewers get an upgrade with a flavorful yogurt sauce, which the chicken marinades in all day or overnight. The chicken is good enough to eat plain or only with a chutney, but it’s also delicious filling for a wrap with cucumbers, bell peppers, and a dollop of hummus or yogurt. Pulse together yogurt, mint, lemon juice, ginger, garam masala, brown sugar, and salt in a food processor or high-powered blender. Or, mix all but mint together in a large bowl, and then stir in the finely chopped mint leaves. Add the chicken, and stir to coat. Refrigerate for a couple hours or overnight. When you’re ready to cook, soak the bamboo skewers for 10 minutes as the grill preheats to medium-high. Stack chicken on skewers, and grill for about 5 minutes, or until cooked through. Turn them every minute or so to sear all sides. This sandwich is a common choice of busy bachelors, parents, and college students. But there are ways to upgrade it to something far better than a home-cooked version of fast food. With broccoli and sprouted wheat bread, both the flavor and nutritional content become about more than the melted cheese. Lay out the broccoli florets on a baking sheet, and toss with olive oil, salt, and pepper. Roast in the oven for 8 – 10 minutes. As you heat a skillet over medium-low heat, spread butter on each slice of sprouted wheat bread. 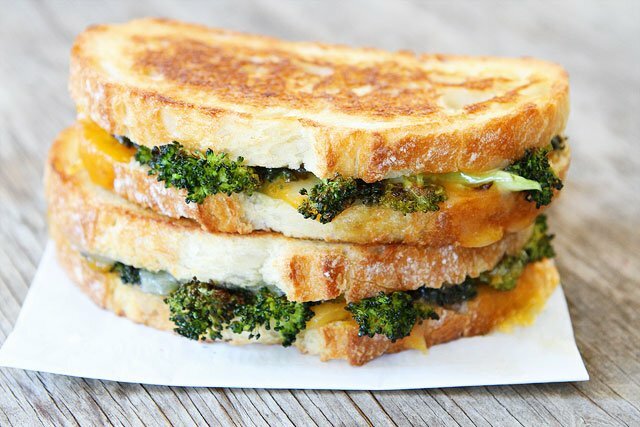 Place four of the slices buttered side down, and top with half the cheese, then roasted broccoli, and the remaining cheese. Top with bread slices, buttered side up. Carefully move sandwiches to the skillet, and fry for a couple minutes on each side. The bread will be nicely browned and crispy, and the cheese will be melted. 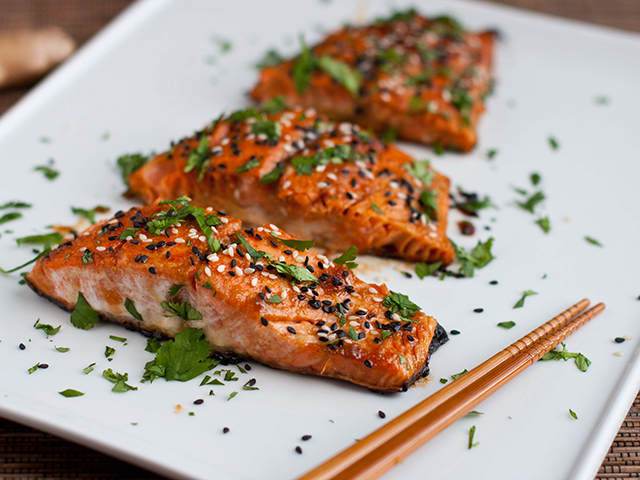 Salmon is one of the healthiest types of fish you can eat. It’s very high in omega-3 fatty acids, which play an important role in maintaining overall health and reducing the risk of disease, and it’s quite dense in vitamins and minerals like magnesium, potassium, selenium, and B vitamins. It’s also great for cooking because it doesn’t need much to taste great! If you want to add some carbs to this recipe, serve it with 3/4 cup cooked brown rice or quinoa (not included in macros). A day ahead, make the marinade by mixing together fish sauce, sesame oil, soy sauce, honey, and tamarind water in a large bowl. Rinse the salmon fillets, and pat dry. Add to the marinade bowl, and leave overnight in the fridge (or for at least two hours). Cook the fillets by pan-searing. Place a pan over high heat, and add the salmon, shaking off as much of the sauce as possible before laying them down to sear. Flip salmon fillets when they begin to brown. Reduce heat, pour the tamarind-honey marinade in the pan, and top with sesame seeds. Simmer for 5 – 8 minutes, until the sauce has thickened and salmon is fully cooked. Transfer fish to a serving platter or individual plates. Stir basil into sauce, and spoon it over the salmon fillets. Serve. What did you think of these quick dinner ideas? Have anything else to share? Let me know in the comments below!